Your last one for the ski season. Enjoy. Originally I signed up for the 48km classic race the night before the Birkie. I wanted to try my hand at a classic marathon. After failing to execute at the Birkie the way I wanted I decided to switch to the freestyle race to take another shot at figuring out this marathon thing without the added complexity of kickwaxing. I was able to get a floor to crash on right across the street from the Ridge and therefore I was able to hit the spaghetti feed the night before and got a reasonable amount of sleep with a nice 7:00am wake-up call. I had my cup of cold oats with milk and brown sugar about 7:30 along with my morning coffee. I was over to the start area about 8:30 for a short warm-up and a Gu about 9:00. So no more calories than last time, but I was up for a good hour less than before. My race strategy was pretty simple and had two parts. 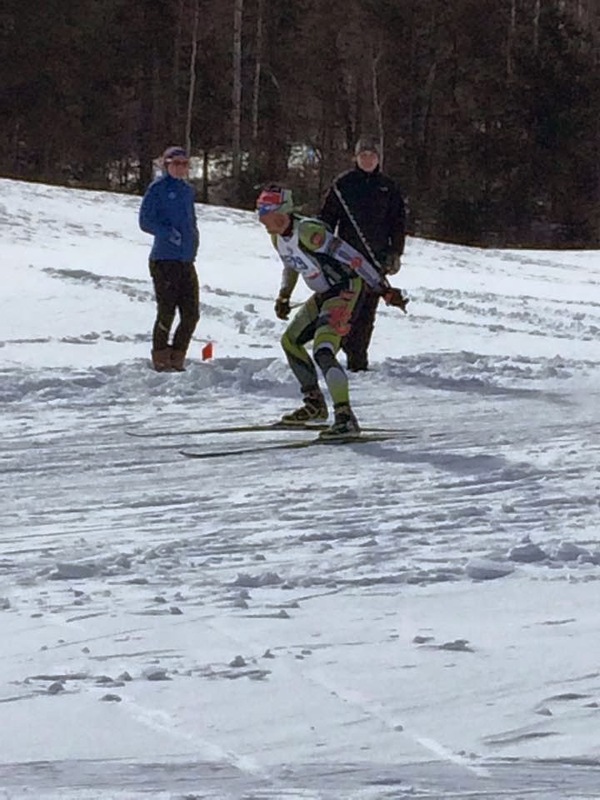 Ski with a HR below 172 until the major climb at the end of lap 2. Take Gus roughly every 10km along with Gatorade on course and the water I had in my bottle. I lined up second row, just behind Tommy. The start was clean and not overly crowded since they separated the 48km and 24km starts this year. As we started the climb up Gold/Cedar the pack was not overly strung out and I was back in maybe 35th position or so. I settled in and relaxed. Here is where I started looking at my watch A LOT. I probably looked at my watch 100 times throughout the race to check my HR. 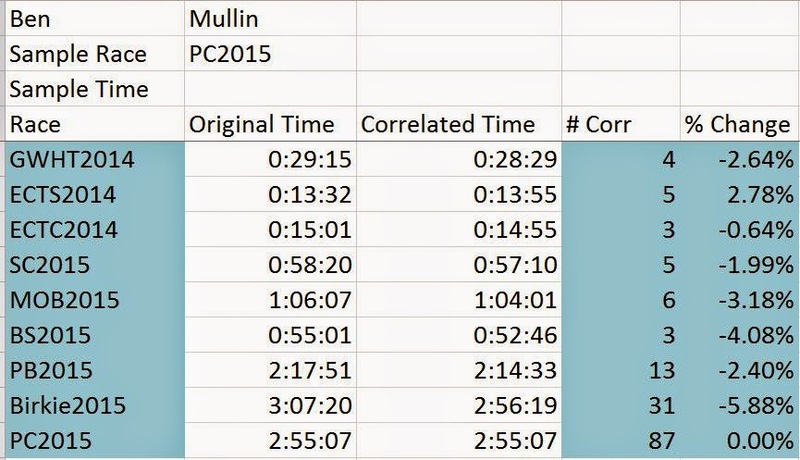 About the same elevation gain as the Birkie, just distributed differently. Sticking with my goal of going easy I started a mental mantra of “easy does it” or just “easy”. Any time I saw a HR above 172 I’d say that to myself and ease off. It is hard at the beginning of a race as people continue to stream around you. By the time we started up Silver at about 5km I must have been in about 45thplace. Instead of being discouraged I decided to be confident in my race strategy. I kept telling myself that there was a long ways to go (43km to be exact at that point) and that people would be coming back to me. Those first two climbs on Silver were a bit spiky. I think I hit close to 180 on the first one. I was very conscious of going easy for the remainder of Silver to be very in control on the climbs and then just ski the transitions well. Not spending any appreciable time above 175 for a change. I executed the rest of the lap pretty much to perfection. I ate my Gus appropriately (though I somehow lost one along the way). The majority of the lap I was skiing solo. Every few km I might pick off a person or two. I maybe had a few hundred meters of skiing behind someone, but otherwise it was my tempo. I caught a few people on the descent back to the stadium for the lap. According to the results I was in 38th place going through the stadium. Initially I thought there may be a huge gap to the next skier. Thankfully the exit to the stadium is out onto the golf course and I could see there were skiers ahead. Still feeling good (nice to hit a lap in a two lap race and not be cursing for signing up for the long race) I still kept things in check and skied to my target. By Silver I had picked up about 5 more skiers. Things got a little spiky again on those first few climbs but I managed to keep things in check. Somewhere along the way I picked up a couple of people, the last one just before the turn onto Wynne Creek. Wynne Creek is a nice section of the course. It gently climbs for about 3km through some swamps and woods. The terrain is perfect for a nice controlled V2. The sun was shining at this point and it was a great day to be out skiing. At the last aid station just before the major climb onto Gold I got my last cup of Gatorade and took a small chunk of banana. The banana didn’t go down well, but I wanted the last little bit of whatever I could get. The last aid station is with 3km to go and they are all downhill so there isn’t much point. Finally, I could let go and open it up. Now granted, open it up, meant that I continued at about the same pace as before. In fact, the next 4.6km I skied a mere 5 seconds faster than I had the lap before. 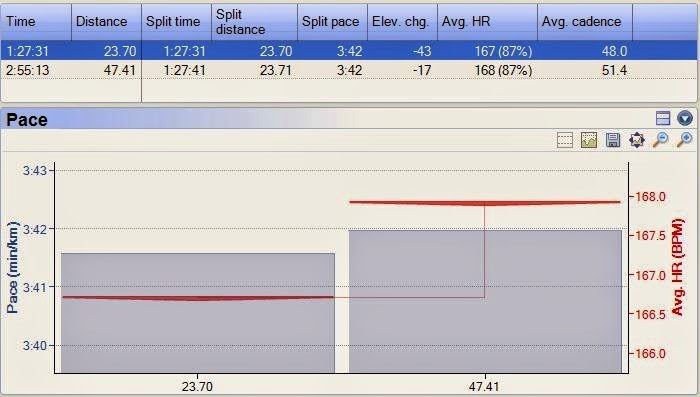 Compare this against last year though were I hit the climb on the second lap and just about came to a stand still. Up until about the last 750m of this stretch I was alone. I was a little disappointed that I wasn’t pulling more people in. Finally after crossing over Summit for the second to last time to loop around I caught sight of someone. This put a little more pep in my step. As I was clawing them back in on the last climb I could see them looking over their shoulder. I knew that look. This added a little more drive to catch them. And then I noticed; there were a couple more people another 200m or so up the trail from him. Attack mode. I crested that bad boy looking for blood. I shouted thanks but no thanks to the Boy Scouts manning the last aid station and set off down the hill. 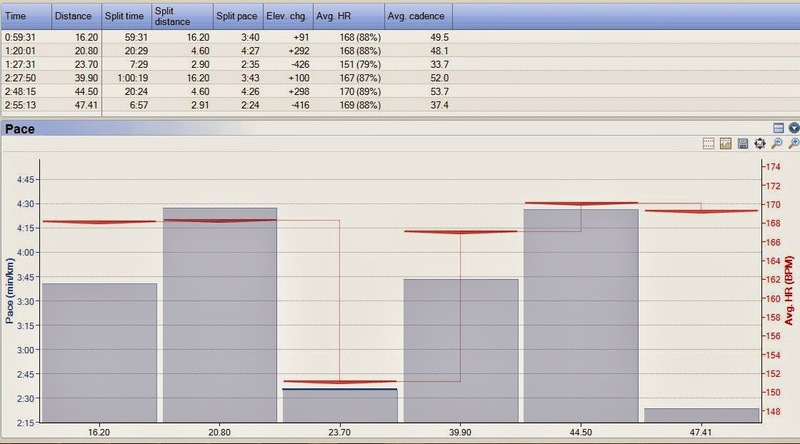 I had 3km of mostly downhill, but with a few turns and short transitions and uphills to work with. I lost track exactly, but I think I passed 3 people before hitting the golf course. And then I saw one more. Headed down for the last turn into the stadium I free skated for all I was worth. My boys were out cheering for me. I rounded the corner wide around the last person and put on a pretty decent sprint for the line. Free skating with about 250m to go. It took me 30 seconds less to cover the same 2.9km the second time. Same course parts on two laps. Hopefully this a link to the finish line video. In the end the race strategy seemed to work out alright. I maybe had a little more left in the tank than necessary. But I maybe left 30 seconds on the course, instead of eating a few minutes so I’m good with that. The analysis of my data shows that I pretty much perfectly split the course. A ten second difference over 24km is about as even as you can get. Looking at the splits for the top 50 skiers, the winner managed to go faster on lap 2, two other people had differentials of less than a minute. The average delta of the first 50 skiers? 6:41! I moved up 13 places in that second lap. A 33% improvement in placing. All by going the same pace. Event splits for the 25th place. So have I nailed the marathon and won’t ever blow up again? Probably not. Do I have a positive example to work from now? Absolutely. My geeked out analysis is good as well. I’m hesitant to put too much stock into it because I’m not sure how serious everyone takes this last fling of the year. Some of us are out for a little redemption and some are out for a good time. For example I know Jay Wenner said he had a pre-race strategy of just having fun. I know Tommy was going hard, but he had skis like the Norwegians in the 10km Freestyle World Championship. Pretty definitively the best race of substance of the season. I’m leaving the ski season hungry for more next year. While transitioning here I’m going to be doing some reading, talking to folks, and planning for next year. This year I had some “goals”. Next year I want to have some SMART goals and plans to achieve them. I’ll let you guess what those goals are for now. I quit ski racing a few years ago but my very best ones went just like you describe…perfectly done.